At the weekend with me we do what are called “combos” which is a bowl usually of half a weetabix, one tablespoon of cocoa pops and then 2 tablespoons of porridge. It’s random, it looks erm interesting but she eats it all up. HA! brilliant, sounds like my girlie too!! 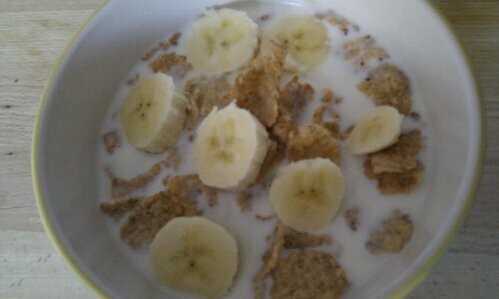 My 2yo son has daddies breakfast, which most days is Weetabix although he gets to have full fat milk on his, I don’t. I wouldn’t mind if they would have Weetabix to be honest, that would be very cool! My children are very unfussy. They will pretty much eat anything at any time. I usually give them a bowl of cereal (weetabix, cornflakes, cheerio-type things or cocopops), toast and jam, fresh fruit, yogurt dried fruit and honey or any combination of those. For a rare treat breakfast last weekend they had natural yogurt with honey and dried fruit, with sweets and sprinkles on top. Was it revealed how she did get the smarties to stick to the bread? This was my first thought when I heard about it, shortly followed by how gross I thought bread and chocolate would taste. The jist of the article was that the school was being looked at for a new school dinner program so no unfortunately I never got to find out, I’m hoping she wasn’t putting nutella on to *fix* them down…there would be a sugar rush!! Lovely, I’ll give you a tip with scientific backing. Give them anything for breakfast. That’s right, anything, the important thing is that they eat breakfast. Obviously in the grand scheme of things, a low sugar cereal is perfect but children who eat high sugar options do no worse than those eating low sugar ones, and both sets of children do way better than those who don’t eat breakfast at all. I despair with breakfast! The Boy can’t manage much that early in the morning and as it’s daddy who gives it to him every day, neither can he. Daddy’s stock response is Hot Bready Ek (as The Boy calls it) *every* day! I’ve started moving the cereal packets around in the cupboard so he doesn’t automatically go for Ready Brek. Problem now is that The Boy expects it and can’t cope if it’s not there! Some days we’ll get him to have mummy’s special yoghurt (Onken Cherry Live Yoghurt), and we’ve started with multigrain hoops or Rice Krispies. On weekends I try to cook a full breakfast, so he has scrambled eggs, beans and a sausage. My problem is not the child, it’s the father! !